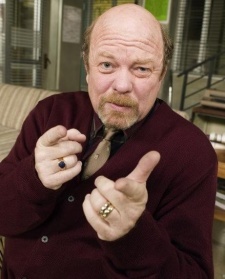 Philip Stephen "Phil" Hendrie is an American radio personality and voice actor who provided the voices of every member of the forever dying Waterfall family in Futurama as well as a spray painter in "A Taste of Freedom". He is best known as the host of the self-titled The Phil Hendrie Show, a comedy talk radio program syndicated throughout the United States. He is also an actor, doing voices for King of the Hill and having recurring roles in The Unit and on the short-lived U.S. version of Teachers. This page was last edited on 1 September 2014, at 23:32.